January is National Egg Month and we’re starting to get the word out early about the campaign to use healthier eggs in your cooking. As a mother of a young child, I opt for NestFresh Eggs’ non-GMO, pasture-raised, or hormone-free organic eggs. It makes me feel better knowing what goes into my child’s body, especially when eggs are one of her favorite foods! 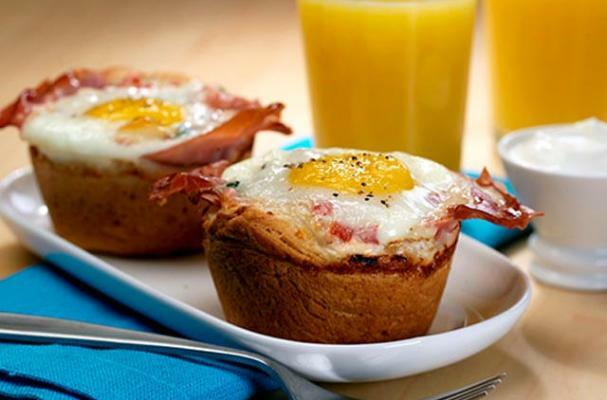 Check out the NestFresh blog for more egg-cellent egg recipes like the Prosciutto and Egg Biscuit Cups below. You’ll discover delicious and easy recipes for breakfast, lunch and dinner. Recipe created exclusively for Easy Home Meals by dairy aisle expert and expert Chef Aida Mollenkamp. Heat oven to 350°F and arrange rack in the middle. Coat 6 jumbo muffin well or 6 (6 oz.) heatproof ramekins or cups with cooking spray. Separate biscuit dough into 6 pieces then place 1 in each muffin cup. Press the dough two-thirds of the way up sides of muffin wells. Lay one piece of prosciutto on top of each biscuit dough piece, allowing the ends of each prosciutto piece to stick out of the muffin well. Divide spinach then peppers and cheese among muffin wells and finally crack an egg over the top of each. Bake until egg whites are set, about 20 to 25 minutes. Run a butter knife around muffin wells to loosen. Serve immediately, with a dollop of sour cream and/or salsa, if using.